Exo-Safe is the first automated periotome that preserves the bone plate with an action that easily mobilises the tooth and fractured roots as the periotome makes it easy to search for root fulcrum for elevation then extraction. Exo Safe comprises a set of six periotomes and the automatic impactor (SAFE). Periotomes securely lock into the automatic impactor (SAFE) which is directly connected to a micro motor (air or electric). 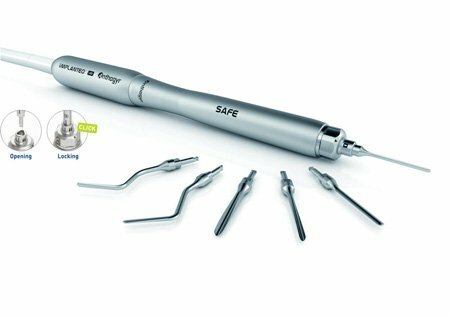 Exo Safe is designed for all types of dental practitioners. The main advantage of Exo Safe is the preservation of bone integrity. It thus allows the practitioner to avoid reconstruction and/or grafts while facilitating the placement of a post-extraction implant. The ergonomically designed impactor (SAFE) enables one-handed handling in the mouth more easily, improving the practitioner’s dexterity and better intra-operative visibility. Exo Safe’s constant impactions with regular intensity facilitate the gradual enlargement of the desmodontal space—thus creating less trauma and leading to greater patient acceptance and comfort.